Simple and easy to build for very low cost. 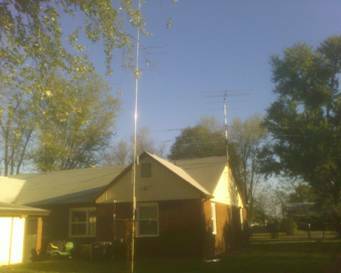 The inverted L is the best way I have found to get on 160m the size fo the antenna and low cost is a great and it’s performance is wonderful. A little history on this choice. 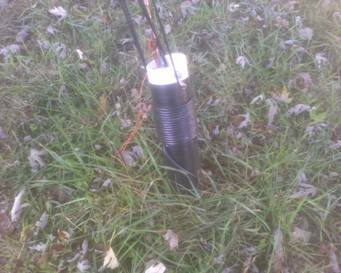 I started out with a 80m full wave loop on my 1/2 acre lot fed with ladder line it rocked but when I tried it on 160m it heard but could not be heard I was losing a lot of power in the tuner as heat, I have the melted inductor to prove it. I tried feeding as a long wire next to no good, so down it came and more wire added for 160m full wave loop. Finally a good SWR but except for a few locals it just did not work good for DX. 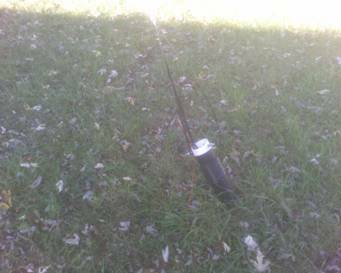 So next the HF9V to my surprise the antenna performed well, and at the mere cost of $$$$ well I had the antenna already so 160$ for the coil was not bad after paying 100+ for a Alpha Delta Short Dipole and slopper I will just say do not buy them not worth the shipping cost! Now the HF9V performed well with 2 radials and I worked several east and west coast states but still was not happy with the DX. So now came out the book. After much ado and reading up I decided to try a inverted L I already had a radial farm out in the yard so it would only take 5 minutes to trim a piece of wire and shoot a rope, so off I did and WOW! What a antenna! First Night I worked Canada, Mexico, and 8 new states can’t complain. Over all this has been my best performing antenna as it works on several bands with and with out a tuner and for SWL beacon listing can’t beat it at the low cost. 1. feed point: this had to be strong and account for the tension of the wire element pulling on it and had to have a good ground. So I took a scrap piece of 3in PVC pipe I had about 18in? Long and used a u bolt to mount it to a ground rod. I drilled a hole for a bolt on the top opposite the ground rod. 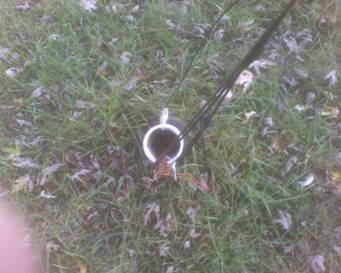 I wound 25 feet of RG8X around the pipe this made a good RF choke, the Center conductor was then connected to the bolt and the shield to the Ground rod at the clamp, this is also where you want to connect the radials. 2. Wire element: too figure out how long your wire is going to be use the basic formula for a 1/4 wave 234/freq in MHZ remember to add enough room for insulator and trimming. I ran mine thru a pulley on the supporting tree so it could move freely and the end is tensioned by a rope thru a pulley and a bucket of sand. 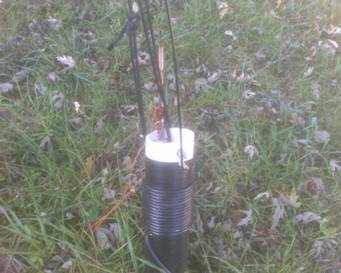 At the feed point about 3 foot from the end of your wire wrap it thru a insulator and tie a 2.5 foot rope between the insulator and ground rod. When you connect the wire to the bolt it should be slacked so that the rope gets the tension from the wind and not the bolt. Also remember when driving the ground rod in to do this at a angle this will keep the rope from pulling it out. 3. Radials: Radials are simple use the same formula and add 12 in. 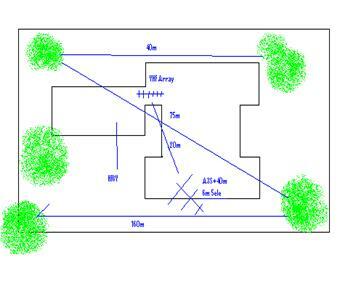 to lay them out they do not have to be straight or any particular direction but the experts will say it does matter ba hung bug! For grins and giggles I disconnected my radials and the 1:1 frequency did go up 40 kc so they make a difference. 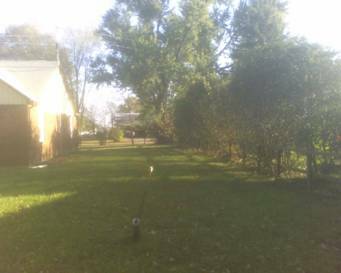 I run 4 radials 1 runs down the property line in each direction from the corner of the lot the feed is in the other 2 zig zag thru the back area of the house, I tied them to the radials on the HF9V so there is a good field for the other bands too. As far as stapling them down that is exactly what I did Stapled them with yard staples took about 20 min to put them in but I did put one every 6 in which I’m told is over kill. Materials I recommend is the 13g 7 strand copper clad wire from the Rf Connection in MD www.therfc.com it is indestructible and is strong as all get out. For radials use the buried dog fence wire available frome home Depot for 500ft 7$ it is red so it is easy to see until it’s thatched in and is treated to not disappear into the dirt as bio matter! I run the antenna with a 1.5 :1 from 1820—1890 the amp doesn’t seem to mind I use a mfj 989 to tune on the rest of the band works great! And have 63 countries on 160m on 41 States.